The origins of the Canadian Northern Railway (later Canadian National) in Red Deer go back to 1908 when coalfields were discovered in the foothills, west of Rocky Mountain House. A group of German investors created Brazeau Colleries and teamed up with Mackenzie and Mann of the Canadian Northern Railway to exploit this rich discovery. Mackenzie and Mann were in a great rush to get started. They filed a route map with the federal authorities in August 1910, even though they had done virtually no surveying for the prospective rail line. They were able to do this by borrowing heavily from the Alberta Central Railway's surveys that had been made from the Red Deer area to Rocky Mountain House the preceding winter. Not surprisingly, the federal government balked at approving such duplication. C.N. was directed to move its line farther north. However, the company was in no mood to slow down. They pushed their grade from the Stettler area to Blackfalds by the fall of 1910. Mackenzie and Mann also applied for a charter from the provincial government to help resolve its dispute with Ottawa. After some controversy, the province agreed to give a charter to a newly-formed subsidiary, the Canadian Northern Western. The people of Red Deer were concerned that the C.N.W.R. was going to bypass the community. Pressure was consequently mounted to have a branch line built to the fledgling Village of North Red Deer and then on into Red Deer. The C.N.W.R. was too far advanced to accommodate the requests. However, Mackenzie and Mann did decide to construct another rail line from Strathcona (South Edmonton) through Red Deer to Calgary. At the beginning of 1911, a contract was awarded to the Northern Construction Co. another firm which Mackenzie and Mann had substantial interests. Northern Construction announced that most of its energies would be devoted to the C.N.W.R. line. However, contractor also stated that it would soon start work on the portion of the new "S" line from the C.N.R.W. near Blackfalds to North Red Deer and Red Deer. In the late summer and early fall of 1911, Northern Construction set up a large camp on the old Exhibition Grounds south of 45 St. and another near the McBlane house in what is now the Pines subdivision. Work began on the grade along the edge of the North Hill. By June 1912, the C.N.W.R. was completed as far as Rocky Mountain House, but the C.N.R. seemed to be losing interest in the "S" line. While the company finished the rail link to Nordegg by August 1914, very little progress had been made on the branch into North Red Deer. One problem was a surprising amount of quicksand and the frequent slippage of the hillside in North Red Deer. The outbreak of the First World War was a huge setback to all major construction projects. In 1915, the C.N.R. asked for major financial concessions from the City of Red Deer, but the City wisely declined. In August 1916, work began on a bridge across the Red Deer River near the mouth of Waskasoo Creek. However, the bridge was badly located and poorly built. Frequent reconstruction of the bridge resulted. Moreover, eventually, the rail bed was largely shifted from the shoulder of the North Hill to the flats closer to the river. In 1917, the Canadian Northern went bankrupt and was taken over by the federal government. In 1919, the new government-owned Canadian National restarted work on the line into Red Deer. Mayor W.E. Lord pushed to have the new C.N. terminal and stockyards built in North Red Deer as that seemed to be more practical than continually rebuilding the bridge across the river. However, he was overruled by the rest of Council. The new station yards were subsequently located where the Park Plaza Shopping Centre is now located along 47 Avenue. In 1920, the line into the Village of North Red Deer and the City of Red Deer was finally completed. However, it was never heavily used. In 1941, the C.N.R. abandoned its troublesome bridge. In 1960, all of the line south of the river was abandoned and a new terminal and railyards were constructed in the new Riverside Industrial Park. 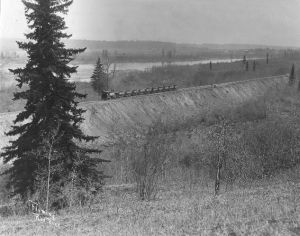 A LOOK BACK - The new Canadian Northern Railway line in North Red Deer, east of the current Riverside Industrial Park, 1912. Across the river is what is now the Gaetz Lakes Sanctuary. Photo courtesy of the Red Deer and District Archives Nancy Ross collection.